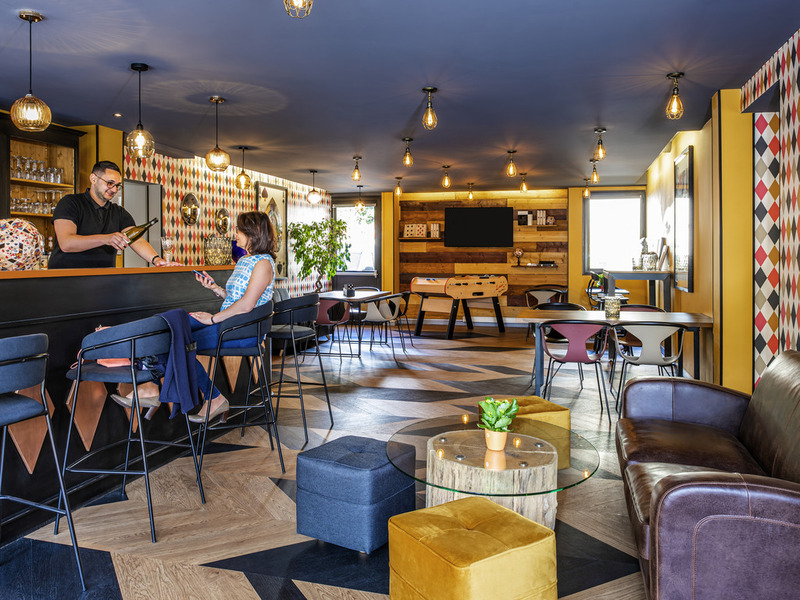 We always stop on the way to Provence and staying in the Ibis Style Reims is the perfect place to break up a very long journey. Generally very good & pleasant stay - matching our expectations. Room lighting was poor though. I would not stay at an IBIS Styles again. The breakfast room was very harsh and unpleasant, with a mix of so called styles. I am not sure why you need to have a range of different IBIS hotels as the original concept was very good. I had a good impression of all ACCOR hotels before staying at this IBIS. Not any more. ok , bt the new decorations ????? The hotel was undergoing refurbishment , there was the smell of fresh paint everywhere , it was impossible to open the bedroom window ( catch removed ) , therefore not the best nights sleep . Breakfast was very good however . Disappointed, hotel was undergoing work and the Wi-fi was either not working or running at snail pace. Our room was situated above the vehicle entrance and when we opened the window for the night we had the noise of the A/C plant on the ground. Also they decided to put out the rubbish towards 6 o'clock and woke us up. Excellent hotel and excellent location! Helpful reception, lovely breakfast and very clean! We book every year in February 4 double rooms in this hotel. Receptionists are ok, not very friendly. Location, rooms, breakfast and parking is fine. This time we forgot a bag with cloths and asked to send themtous. Noreply to our email after 4 days now. That is a worse attitude not to answer !!!!! We often book Arcor hotels worldwide but with this experience we plan to stop that. The room was extremely clean and adequately furnished though cold at first. We were able to rectify this by turning on the thermostat. Breakfast was very satisfactory with a range of breads, patisseries, cold meat and cheeses. There had been an error when we booked as it was recorded as being for 1 person only but the concierge quickly sorted this out when we paid our bill on departure, at no extra cost. We only stayed one night, the room was clean and simple, just what we needed. The staff is extremely friendly and helpful. The breakfast buffet is really good, fresh orange juice a big plus. A very reasonable priced hotel close to the city centre. The hotel is within walking distance of the city centre and the cathedral. The rooms are clean with comfortable beds. A self service breakfast is available which has ample food tasty items to chose from (no English breakfast). I would have given a full stars but for the fact that the hotel providing plastic tumblers in plastic bags in the bathrooms when I feel they could use a more environmental friendly option. I would advise book a park place as the car park is very small and parking in the area is very difficult. the hotel is very well placed for visiting the city of Reimes however the room is on the small size. The staff were helpful, breakfast was good however parking charge is high. Excellent place to stay with own carpark (extra 11 euros per day) within walking distance of the beautiful cathedral. Very good breakfast. Staff very friendly. Very understanding after having to change booking due to travel difficulties- gilets jaunes - and fuel shortages. Extremely helpful. It was reasonably priced and conveniently located. The hotel and accommodation were fine, but the service at reception on arrival and later in the bar was not welcoming. Ibis Styles Reims Centre Cathedrale is located where most of the sights of Reims is just a short walk away. Staff are helpful and the hotel is clean. While I thought the breakfast was fairly average, my wife raved about it and thought it was the best of our trip - I think the freshly squeezed orange juice did it for her. The hotel has a very odd paint scheme that I suspect you either love or hate with no middle ground. Looking like a throw back to 1960s artist Peter Max, it is about as far removed from a conservative Hilton as can be. Rumor has it that the hotel will be undergoing a new theme - playing cards - in about three months time so if you want to experience what ibis describes on the room card holder as &quot;an escape from reality&quot;, you need to go now.